Without video, it’s just a story! 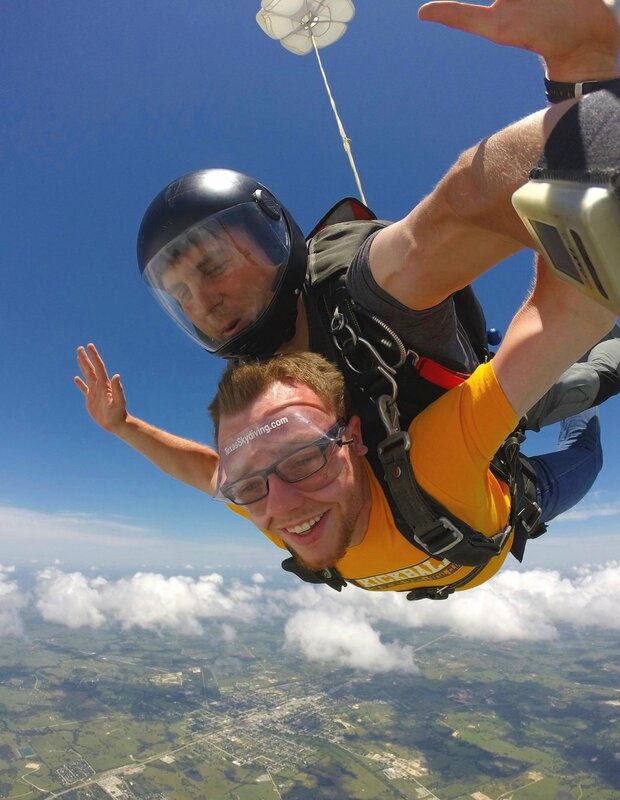 Texas Skydiving offers Camera Flyer and Hand-Cam options to commemorate your adventure in the sky. Our skilled videographers produce crystal clear HD videos you'll want to watch over and over, and amazing digital photos perfect for expanding to poster size or just sharing on social media! After your jump, our video editor creates a professionally edited work of art you can download via a link sent directly to your preferred email. You can’t lose, literally! Choose the Camera Flyer option to have one of our super-cool videographers fly with you and record beautiful video and digital photos throughout! You’ll get an incredible outside perspective that perfectly captures your experience. This option is available for both tandem and AFF students. Check out the sample video below, and see our Gallery page for more awesome photos! Tandem students have the option to add hand-cam video and/or digital photos, in which the Tandem Instructor wears a wrist-mounted camera for the perfect "selfie" style shot! Benefits include capturing footage while flying the parachute, and a lower price!